Obama's State of the Union will likely address election reform. 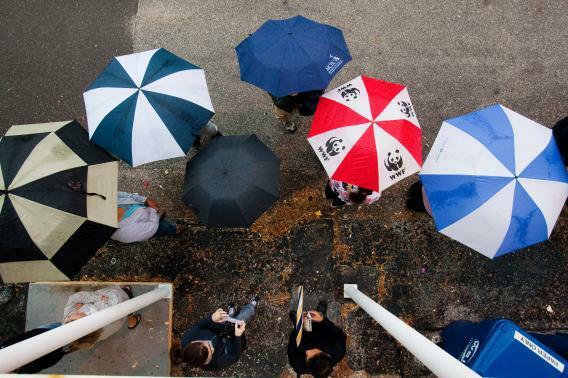 Lines of voters wait in the rain to cast their vote in the presidential election on November 6, 2012 in St. Petersburg, Florida. In all the post-game discussion of President Obama’s second inaugural address, even when conservatives sniped at its liberalism, nobody really mentioned the reference to election reform. “Our journey is not complete until no citizen is forced to wait for hours to exercise the right to vote,” he said. “Whatever,” said critics, focusing on Obama’s references to climate change and gay rights. Voting reform isn’t a partisan issue, even though the last couple of years have mostly seen Republicans limiting early voting or strengthening voter ID laws with a nervous eye glancing at Democratic turnout. Well, the president is elevating the issue again tonight. Desiline Victor, an 102-year old naturalized American (from Haiti), was one of the people stuck in line on Election Day 2012 in Miami. It took her three hours to vote, after the state had cut back on early voting days—a decision so hard to defend that Gov. Rick Scott doesn’t take credit for it anymore. And Victor will be in the First Lady’s seating area during the speech. We don’t have the text of the speech yet, but if the president wants to give a hat-tip to Victor (that’s why you invite these people), he could hype H.R. 12, a Democrats-only voting bill introduced at the start of this Congress that would computerize voter registration and criminalize a few campaign tricks aimed at purging people from voter roles—chiefly “caging,” the practice of sending mail to addresses to prove that nobody lives there. Or Obama could work with Republicans to pass a milder bill. He should have done this when his party controlled most of Congress, but at least he’s leaning on it now.